LONDON • Alex Oxlade-Chamberlain has been ruled out of Liverpool's plans for the new Premier League season with manager Jurgen Klopp admitting it will be "a bonus" if the midfielder plays a competitive game before May. The full extent of the knee injury was revealed on the day Liverpool agreed to a world-record €75 million (S$119 million) fee for Roma goalkeeper Alisson. Oxlade-Chamberlain missed the Champions League final and England's World Cup campaign because of an injury he sustained against Roma on April 24. It has been confirmed the 24-year-old suffered multiple ligament damage and is expected to be out of action for up to 12 months. "We are preparing this season knowing he will not be with us on the pitch for competitive matches for the majority of it. If we do see him back this season, it will be a bonus," Klopp said. Liverpool, and the player, knew the full extent of the injury within days of the semi-final first-leg win at Anfield but did not go public with the prognosis at the request of the England international. 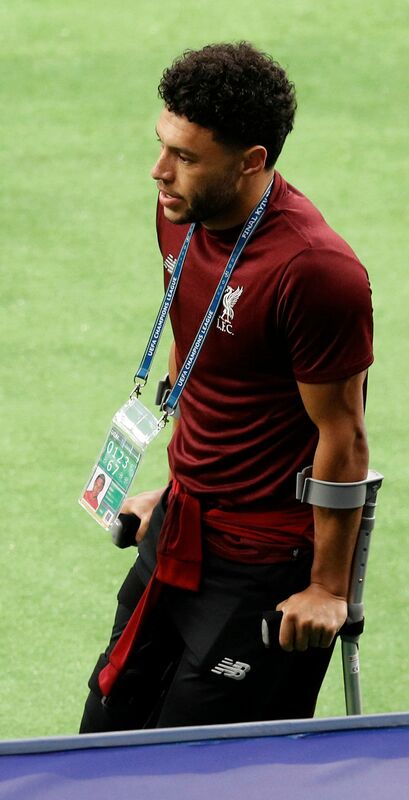 Oxlade-Chamberlain did not want the severity of his ligament damage to disturb the team's preparations for the Champions League final against Real Madrid in May and kept the news between himself, Klopp and the medical staff involved in his recovery. The midfielder had a successful operation and his rehabilitation is on course. Liverpool do not view the injury as career-threatening. "It feels like now is an appropriate time to tell people that for Ox, this coming season will be about focusing on recovery and rehabilitation," Klopp added. "We have known this from pretty much the day after he got the injury and, after the successful surgery, we were sure of it. I hope everyone treats this information responsibly. "There has been no change, no setback - it's exactly on the schedule we expected and planned for. The new information is that we're now giving more details publicly." The length of Oxlade-Chamberlain's absence will not influence Liverpool's transfer business for the remainder of this window. Klopp, as he stated, has been resigned to his absence since April and has added Naby Keita, Fabinho and Xherdan Shaqiri to his outfield options for the new campaign. Goalkeeper Alisson will join the squad on a six-year contract following a medical test and is expected to be Liverpool's final signing of the transfer window. Klopp's priority once the deal is concluded will be to offload several players deemed surplus to requirements, with the manager admitting his squad are too big. Simon Mignolet, Daniel Sturridge, Danny Ings, Divock Origi and Lazar Markovic could all depart. "Of course we have to sell," Klopp said. "We cannot go with 35-40 players. We need a lot of players but not 40." He added that the summer's transfer business has strengthened his squad considerably. "Maybe it is the first year we don't sell a key player. There was always a lot of change but in both directions. Now it is more in one direction. Big teams, successful teams, if you don't buy it, you have to build it. Of course we have to sell. We cannot go with 35-40 players. We need a lot of players but not 40. JURGEN KLOPP , Liverpool manager. "That means stay together, bring additions in and make the next step. That is how it is. "The team and squad are in a really good moment. I am really looking forward to the season."